Note: the board is the same, and additional tiles can be purchased to make it a 4 player game. Wordfare! 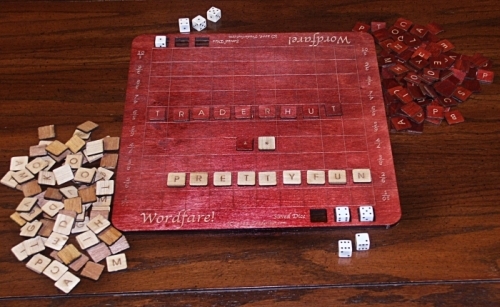 is an exciting new game that combines the fun of Scrabble with the strategy of chess! However, unlike chess, you don't need to be a mastermind to be good at it. Unlike scrabble, the person with the best 'scrabble' vocabulary doesn't always win. Wordfare! 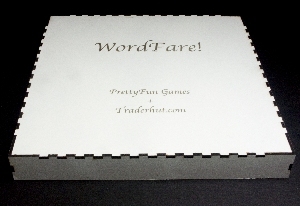 has been called 'the most innovative word game since Scrabble' and makes an excellent gift for anyone who enjoys words or word games. You can read a recent review of the game by Tom Vasel at www.thedicetower.com. He comments that he likes the game more than scrabble, and so do we!